But Protective measures are no longer the exclusive domain of military, intelligence, forensic and governmental bodies. The high-performance shielding products are available for any company or legal entity taking its data protection seriously. 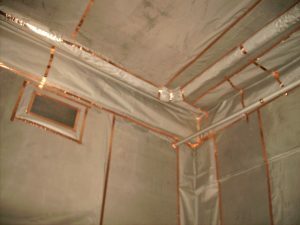 Copper foil has both electric field high Shielding properties (till 120 dB), and magnetic field. It has an easy installation method, thanks to its special wall, ceiling and floor adhesive. It has an excellent closing capacity forming a Faraday Cage, included in the case of low frequencies. The system is easy to mount in reinforced doors. 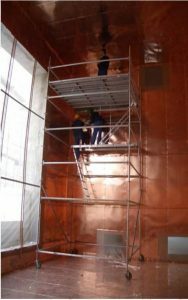 The Copper standard width is 1.000 mm and the sheet can be delivered in coil or in tailor-made pieces. 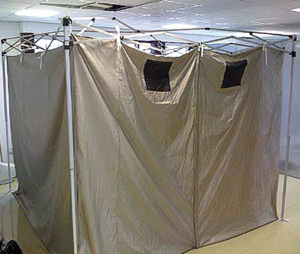 Fabric Tents EMI/RFI are made of a hight conductive texil. 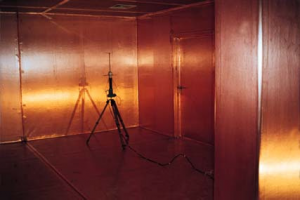 The applications are typically EMC experiments, RF measuring, forensics/military activities and personal protection in the field. The Farady fabrics offer mobile solutions for only a price fraction comparing the conventional Faraday cage. To fix the Faraday Fabric is fast and very easy. They are delivered in the standard mode with multiple cords to make easier the assembling to the ceiling or with a freestanding frame. Optionally the Farady Fabric can be delivered with an easy set up frame and /or plastic lock. 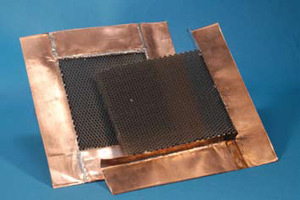 The RFI/EMI shield fabric are made of an high conductive material, light and ultra durable. 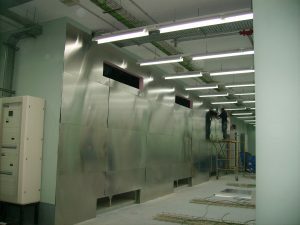 Magnetic Field Shielding in Data Centers protect the Critical Environment against magnetic fields, present in installations where strong currents are generated or transported, for example in transformer rooms, power lines, busbar systems and high-voltage cables. According to EN 61000-4-8 level, protection with high magnetic permeability materials with the ability to absorb magnetic energy allows for the highest possible attenuation, making this shielding alloy the material of choice for reducing low-frequency electromagnetic interference.